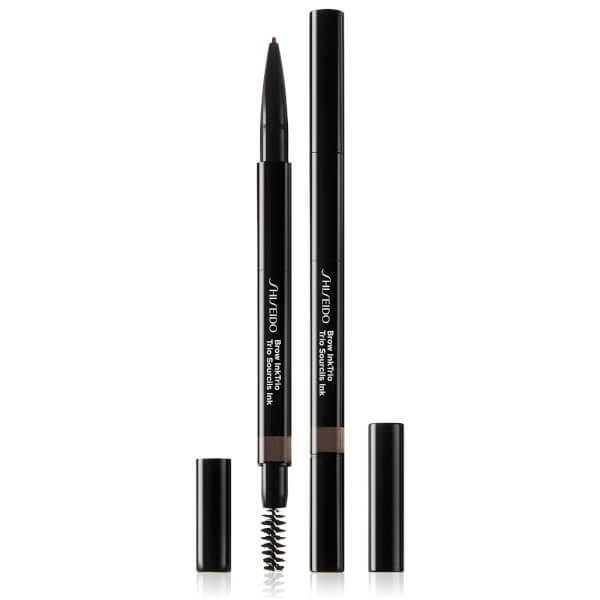 Frame your eyes with enviable arches with the Shiseido Brow InkTrio; a 3-in-1 pencil, powder and brush that expertly balances, fills, and defines brows. Designed with a slim, retractable pencil for shaping the brows, the centre of the tool opens to reveal a sponge-tip applicator pre-loaded with a weightless powder to fill in sparse areas and add depth without hard edges. A built-in spooly brush on the other side of the dual-ended InkTrio conveniently blends and grooms for a polished look. Arriving in several neutral shades that suit every hair and skin tone, the pencil is formulated using multidimensional pigments and Ester Oil to deliver a healthy sheen with superior glide, whilst natural waxes provide the pencil with structure for extreme precision and control. Brush up brows with the brush. Then, fill in the shape with the retractable pencil end and/or the twist-open powder sponge at the center of the pencil. Finish by combing through hair to blend the pigment and set arches in place. Fluorphlogopite, Stearic Acid,Titanium Dioxide (Ci 77891), Rhus Succedanea Fruit Wax, Iron Oxides (Ci 77492), Hydrogenated Castor Oil, Triethylhexanoin, Dipentaerythrityl Tetrahydroxystearate/Tetraisostearate, Sucrose Tetrastearate Triacetate, Iron Oxides (Ci 77491), Iron Oxides (Ci 77499), Sorbitan Sesquioleate, Aluminum Hydroxide, Mica, Tocopherol/Mica, Talc, Triisostearin, Ethylhexyl Hydroxystearate, Silica, Iron Oxides (Ci 77492), Titanium Dioxide (Ci 77891), Dimethicone, Iron Oxides (Ci 77499), Iron Oxides (Ci 77491), Sorbitan Isostearate, Dipentaerythrityl Tetrahydroxystearate/Tetraisostearate, Methicone, Magnesium Stearate, Phenoxyethanol, Sodium Dehydroacetate, Aluminum Hydroxide, Tocopherol.